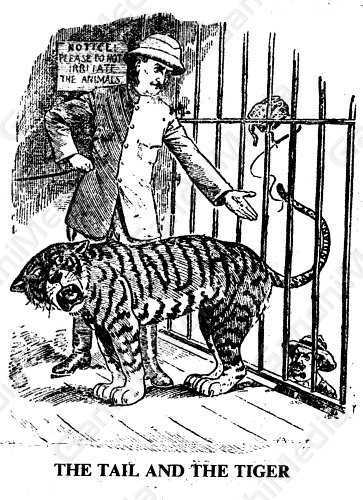 The Tail And The Tiger - Viceroy of India (to General Botha): “I’m sure you only meant to have a little harmless fun with his tail, but what’s fun to you may be very annoying to the rest of the tiger.” – 1908. This cartoon shows the Viceroy of India warning General Botha, a leader of the Boers, that he should not proceed with the imposition of a poll tax of £3 on Indians in the Transvaal as this discriminatory measure, aimed at all Asians, would invite strong resistance. The Government of the colony ignored the advice and imposed the tax, which became an additional ground for the prolonged passive resistance movement Gandhi organized in the territory.